Kindergartners are making great strides in French class as they continue to develop their comprehension and speaking skills. One of the most exciting highlights of French class lately has been the study of the parts of the body in French. The students loved getting up and moving around as they learned to sing the French equivalent of the popular song, “Head, Shoulders, Knees, and Toes.” They also thoroughly enjoyed playing “Simon Dit,” to practice these new terms. Keep up the great work, Kindergarten! If you ask the first graders to describe their family to you in French, they will be able to tell you all about it. They have been learning about all of the different family members as well as a variety of pets that can also sometimes be part of families. The students put together their own family in a setting of their choice and delivered a presentation about it to their classmates. First graders particularly enjoyed their fun French song about a very large family all living together under the same roof of a very small house. They were quite amused! The second graders charmed the entire school community with their French carol, “Vive le Vent,” at the Cookie Party before winter break. It was impressive how well they did, having memorized all the lyrics just a few short days after their play! In class, they have added a more intensive written component to their French studies, and they are enjoying the newly introduced homework component. One highlight of their class has been the study of le petit déjeuner (breakfast) in France, leading up to their own in-school French breakfast experience! Third graders are moving along quite well with their French studies. One highlight of the class was their trip to L’alliance Française de Washington where the students got to participate in a program on la francophonie, which went hand in hand with the projects they had completed earlier in the year. They explored where in the world French is spoken, looked at the flags of those countries, and also learned about different French bandes-dessinées (cartoons). The students expressed much appreciation for this opportunity, and they were also challenged by the exposure to native French speakers in a different setting. Overall, it was a great experience! In France, food is a typical topic of conversation, one that rivals talking about the weather. Fortunately, in French class, students talk about both! The class projects on French-speaking countries helped the students understand what people in other countries like to eat. The fourth graders learned the vocabulary for weather, personal descriptions, and the farm. Each student had an opportunity to present the weather as we see on TV. The students did a wonderful job! The fifth grade has reviewed vocabulary associated with leisure activities, the family, and describing people. 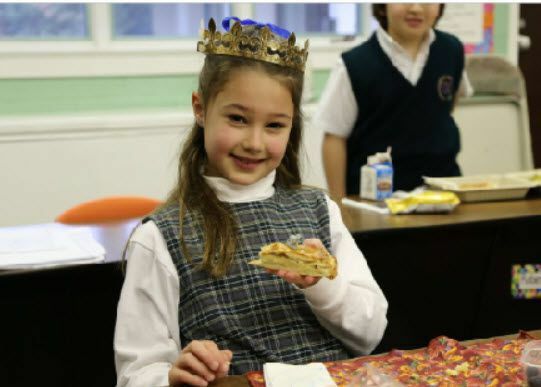 In January, the class was able to celebrate La Fête des Rois with the traditional galette. The student who found the fève, or prize, was crowned king or queen. The rest of the class shouted “Vive le Roi, Vive la Reine” or “Long live the King, Long live the Queen.” Merci to M. et Mme Couraud for the delicious galettes! The class has also learned about the different French-speaking countries during the “Language Weeks.” M. Fleming demonstrated how to make quiche in preparation for the French café. The sixth grade has learned about going to a restaurant, shopping for clothing, and describing activities in the past. The class also presented their first PowerPoint in French during Language Weeks. Each student presented his or her country to the class. The entire school celebrated the annual “Hat Day” or “La Sainte Catherine.” This traditional French holiday is based on a French custom associated with Saint Catherine’s Day, when unmarried women reaching 25 years of age would decorate an elaborate hat to illustrate their fine qualities in order to attract suitors. The entire school showed off their creativity in class and at an assembly on November 19. Seventh graders completed projects for Language Week, imagining they were people from French-speaking countries. They introduced themselves to the class, giving personal information and facts about their assigned country. Seventh graders enjoyed preparing an old French carol called “Un Flambeau, Jeanette, Isabelle” for the cookie party and learning the history of this song. Eighth graders continue to add new vocabulary and verb tenses to their toolboxes. They enjoy having conversations in class in French and continue to develop their confidence and the flow of their spoken French. Both seventh and eighth graders learned about how the French celebrate Epiphany with Galettes des Rois (King Cakes). Students enjoyed searching for the baby figurine and crowning the king of the class for the day, as they sampled this French traditional cake. The beauty of projects is the opportunity to put into action, into concrete form, what has been taught and learned over a period of time. Basing the task on a specific aspect of the recent coursework, yet allowing for individual approach and interpretation of the theme presents as much a challenge to the teacher as does the execution of the idea to the student. Recently, the eighth graders toiled with the writing of an original Latin story based on their Latin readings of strange and inexplicable events. Long before Edgar Allen Poe wrote his tales of mystery and terror, Latin authors explored this genre. Petronius and Pliny both authored captivating stories that have both intrigued and entertained the eighth graders. Their task was to compose their very own tale of mystery (and in some cases, they added mayhem), while demonstrating their Latin language skills, especially those gleaned from the classical authors.